Fresh Christmas trees look and feel the same as they did before they were cut. They have supple foliage, a natural dark green color, and a tight hold on their needles. 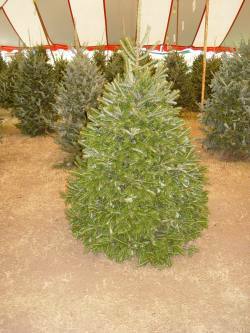 Fresh Christmas trees have the capacity to take up water when the consumer displays it in his or her home. A fresh Christmas tree will look almost as good displayed after Christmas as when it was first decorated. The tree is in good condition and able to rapidly take up water under proper care. 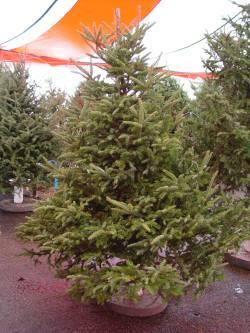 Fresh trees will perform well in the home and represent no fire hazard. The tree is still capable of slowly taking up water under proper care. The tree performs normally in the home with no fire hazard. The tree is unlikely to take up water even under proper care and likely to continue to dry out. Dry trees at the time of purchase represent quality and safety issues for your consumers. 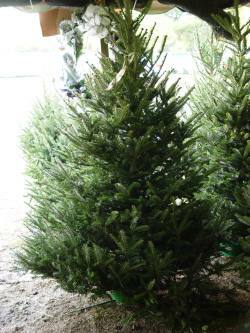 Different tree species will have different moisture content thresholds from Fraser fir. Readily take up water provided in the stand. Resist ignition from an open flame. Branches and needles remain limber. Trunk can crack if exposed to rapid drying. Take up water from stand slowly, if at all. Will ignite if a flame or spark is provided. Branches and needles become stiff and brittle. Bleach out to a pale green or yellow-green. Unlikely to develop a new crack if wood is dry. Determining moisture content from foliage samples from cut Christmas trees on North Carolina farms. Determining moisture content of stored and displayed trees on retail lots. Evaluating Christmas tree retailers’ tree care techniques. Trees were very fresh on North Carolina farms. Freshness problems occurred in all retailer segments, particularly store-front displays and independent lots with no irrigation. Southern exposure can be overcome with optimal care. Trees that are irrigated during storage and display stay fresher. Daily watering is better than occasional watering. Full shade is better than partial shade. Partial shade is better than full sun. Multiple deliveries provide fresher trees than single deliveries.